Fresh from the Final of BBC’s Strictly Come Dancing, Danny Mac and West End leading lady Carley Stenson, will be playing the roles of Sam and Annie in the world premiere of SLEEPLESS the Musical based on the Tristar Pictures Inc. film Sleepless in Seattle. The new musical has a book by Michael Burdett, music by Robert Scott and lyrics by Brendan Cull. The production will open at Theatre Royal Plymouth from 1 to 15 April, followed by a week at The Lowry, Salford from 25 to 29 April, and finishing at Bord Gais Energy Theatre, Dublin from 2 to 13 May, prior to a West End run. SLEEPLESS is the enchanting new romantic musical comedy based on the original story and screenplay of the movie classic Sleepless In Seattle. Like the much loved movie, SLEEPLESS tells the heart-warming tale of Sam, who moves to Seattle with his eight year-old son, Jonah, following the tragic death of his wife. When Jonah phones a radio show, Sam is forced to talk about his broken heart and sleepless nights live on air, and he suddenly finds himself one of the most sought after single men in America and a great news story for feisty journalist Annie on the opposite side of the country. A fresh and lively book alongside a brand-new musical score bring this most timeless of romantic comedies to life on stage. Danny Mac is best known for playing the role of Mark ‘Dodger’ Savage in Channel 4’s Hollyoaks. He was given his first professional role as Gavroche in Cameron Mackintosh's touring production of Les Misérables, a role he reprised in London's West End at the Palace Theatre in 1999. After graduating from drama school, he went straight into Wicked at the Apollo Victoria. Most recently, he played Warner in Legally Blonde at the Leicester Curve. Danny Mac and Carley Stenson are joined by Jennie Dale as Becky and Cory English as Rob. Jennie’s most recent theatre credits include Maggie Jones in 42nd Street (Théâtre du Châtelet, Paris) Deb in Elf (Dominion Theatre), Dora in Singin' in the Rain (Théâtre du Châtelet, Paris) and Mae in The Pajama Game (Shaftesbury Theatre). On television, Jennie has appeared in The Tracey Ullman Show and Victoria Wood's Mid-life Christmasand What Larks. Cory English can currently be seen in She Loves Me at the Menier Chocolate Factory. His many previous musical theatre credits include Max Bialystock in the UK Tour of The Producers, Igor in Young Frankenstein and Max Bialystock in The Producers, both for Susan Stroman on Broadway, and Benny Southstreet in Michael Grandage’s West End production of Guys & Dolls. SLEEPLESS will be directed by Morgan Young (Elf, White Christmas, Big), with set design by Morgan Large, costume design by Sue Simmerling, lighting by Tim Lutkin, video design by Ian William Galloway, sound design by Avgoustos Psillas and Terry Jardine for Autograph, orchestrations and musical supervision by Larry Blank, wig and hair design by Richard Mawbey and casting by Sarah Bird CDG. The world premiere of SLEEPLESS is a Theatre Royal Plymouth production presented by Michael Rose and David Shor, in association with Marc Toberoff and the Bord Gais Energy Theatre, Dublin. 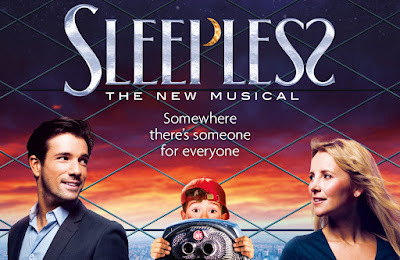 For further details, please visit www.sleeplessthemusical.com.